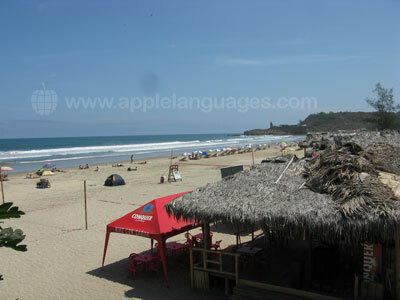 Learn Spanish on the stunning beaches of Montañita! Our school’s poolside cabañas are the perfect place to relax after your Spanish lessons. 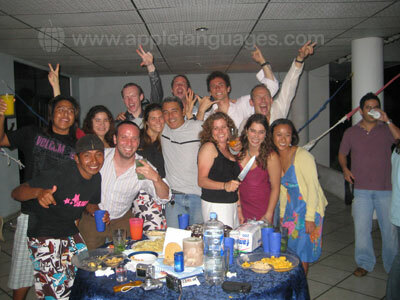 A Spanish course in Montañita offers you much more than just the chance to study Spanish though. This unspoilt paradise is renowned for its superb surf, and the enticing Pacific waters are also ideal for scuba diving, snorkelling and many other water sports. At our school, you can combine your Spanish studies with classes in surfing, Salsa, yoga and other exciting activities! Once the sun sets, enjoy excellent seafood dishes in a beachside restaurant, or dance the night away in one of Montañita’s many bars! Beyond the beaches lies miles of lush forest, including Machalilla National Park, home to incredibly rare, indigenous wildlife. Our Spanish school also arranges trips to the remarkable Galápagos Islands, where you can glimpse giant tortoises and share the beach with sea lions and penguins! 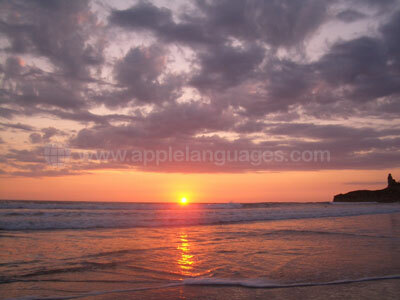 Enjoy views of rolling Pacific waves whilst you learn Spanish in Montañita! Many of our classrooms overlook the beach, with other lessons taking place on the shaded patio area. There is also a kitchen area, where you can prepare snacks and meals. Montañita town centre is just a two-minute walk from the school. One of the great advantages of learning Spanish at our Montañita school is the small class sizes. The Standard course (20 lessons per week) has a maximum class size of only five students. In such small classes, you’ll receive plenty of attention from your highly-skilled teachers, so your Spanish will quickly improve! If you’d like to learn at an even quicker pace, Private Lessons are available too. For both beginners and experienced surfers, Montañita is one of the best surfing locations in South America! It offers reliable waves and a real surfing culture. Our school’s Spanish & Surf course comprises five 90-minute surf lessons with a professional instructor (plus board) per week, to be taken in conjunction with a Spanish language course. 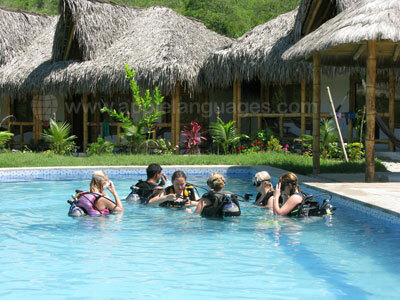 Other activity courses run by the school include kitesurfing, scuba diving, Salsa and yoga. Any of these programs can be combined with a Standard Course or individual tuition. Why not give something back to the local community as you learn Spanish in Montañita? Anybody can take a Volunteer Work program, helping in schools, clinics, nurseries or veterinary practices. If you’re a medical student or professional, you can gain experience in local hospitals after taking specialist Medical Spanish lessons in the morning. Enjoy the convenience and comfort of our school’s traditional cabañas! Complete with en-suite bathrooms, hammocks and fans, the cabañas are located less than five minutes’ walk from the school, beach and town centre. They share a kitchen, outdoor swimming pool and jacuzzi! If you want to develop your language skills as quickly as possible, we recommend that you live with a local host family. Our school only chooses host families who are friendly, hospitable and eager to help you practice your Spanish! Shared student apartments are also available, which are perfect for saving money and socialising more with your fellow students. 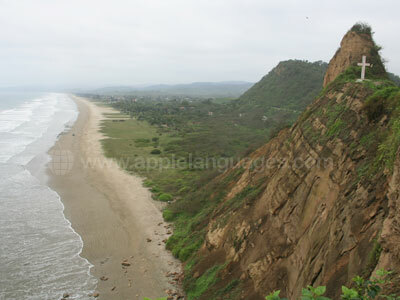 Let our school show you the best of this beautiful part of Ecuador! The school regularly organises horse riding and surfing trips, as well as excursions to Isla Del Plata, an island of exquisite natural beauty. Other typical activities include dance lessons and cookery classes. Transfers from Guayaquil Airport are available with our school, although they are not included in the cost of the course.